As 2017 beckons, CIOs are widely expected to accelerate the use of Amazon Web Services (AWS) alongside a second public cloud service, presenting other providers with new revenue streams. Billed as AWS+1, the emerging operating principle comes at a time when industry analysts predict the rise of cloud-services brokers, as outlined during AWS re:Invent in Las Vegas. Findings from 451 Research report that in addition to supporting fiduciary responsibility, a blended cloud strategy ensures CIOs are not locked into a single vendor or location while gaining the flexibility to match applications, workloads and service requests. With large enterprises now spending millions of dollars each year on cloud services, this expenditure has become a noticeable line item on balance sheets. But with an AWS+1 strategy, the analyst firm claimed that the CFO and CIO can demonstrate “value, choice and flexibility”. “In 2017, the growth of hybrid cloud services will usher in the widespread use of brokerages to deliver the right combination of offerings to meet different needs,” 451 Research vice president, William Fellows, said. Looking ahead, Fellows believes brokers’ success will depend on the ability to deliver multiple cloud service types and for those services to be destinations for new application deployments, modernised (as-a-service) and migrated applications. “Every services supplier - with the current exception of the hyper scalers - is becoming a cloud-services broker,” Fellows observed. In 2017, Fellows believes service providers will focus on expanding into untapped markets and higher-value services, such as application management, managed security and business-process hosting that are “beyond infrastructure”, in order to survive. For service providers, selling virtual machines (VMs) alone will win neither market share nor revenue, regardless of how cheap, powerful or feature-rich those VMs are. Partnerships - in particular between firms, which may have previously been regarded as competitors - will lead to a Cambrian explosion of new services, platforms and ecologies, according to analysts. “As AWS+1 becomes an operating principle in 2017, there will be an opportunity for suppliers of cloud management platforms that can aggregate, integrate and provide control for multiple services,” Fellows added. “By making it easy to find and use services, IT departments will increasingly act as service brokers to their own organisations by delivering IT-as-a-Service. “This will enable them to focus resources on business innovation and digital transformation strategies instead of simply keeping the lights on. As the industry approaches 2017, Fellows said IT service providers must offer a more agile “cloud-tasking” delivery model to support digital transformation. In this environment, analysts believe the cloud management platform and the business process management system will be used to link together existing systems with new apps that take advantage of technologies, such as machine learning, to create more efficient, simplified processes. According to Fellows, the managed infrastructure and cloud market remains robust, growing for the “next several years” to encompass more than $US129 billion in spending, with public cloud and hosted private cloud as the predominant sources of growth. While public cloud continues to be the fastest growth engine in the managed infrastructure and cloud segments, Fellows said there is a “slower-moving, but no less important or lucrative”, land rush in the managed infrastructure space. 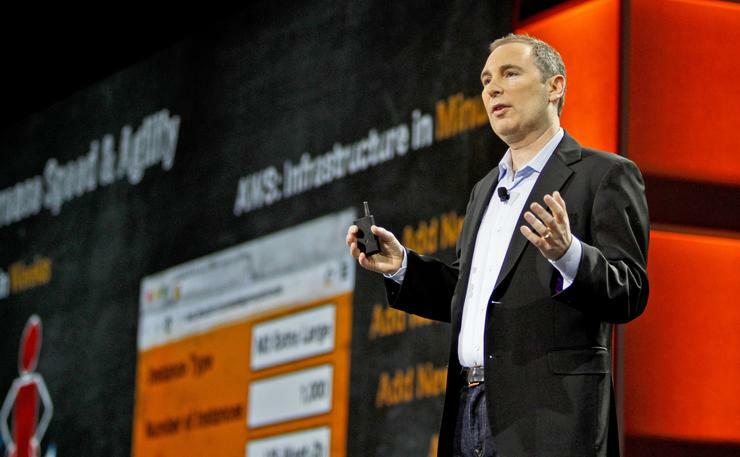 “Managed infrastructure and public cloud are now two sides of the same coin,” he explained. 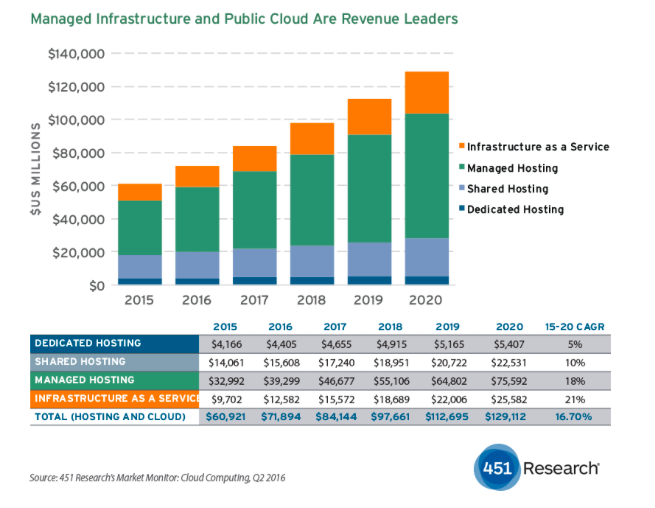 By 2020, 451 Research predicts the Infrastructure-as-a-Service (IaaS) market will be worth $US25.5 billion, or 20 per cent of the overall $US129 billion hosted IT infrastructure market. As a sanity check, Fellows said it’s worth noting that some firms have IT budget-planning cycles that are nearly the size of the entire current IaaS market, which is estimated at $US12.5 billion for 2016. “AWS is still the biggest player in the cloud space,” Fellows added. “In a decade, AWS has achieved revenues of $US12 billion and an enterprise value of some $US150 billion, or half the market cap of Amazon.com. Looking at it another way - it took IBM a century to reach the same valuation. “This not a zero sum game - all segments of the hosted infrastructure market are growing - but the cost of participation is high, so few businesses will be able to afford to build their own.